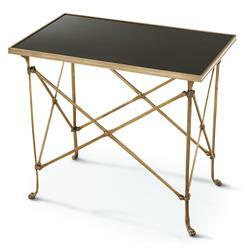 The most beautiful feature of this opulent, black marble end table is its versatility. A streamlined base of antique gold legs with intersecting supports contrasts with the solid, ebony honed marble tabletop. The rectangular surface has ample space for refreshments or showpieces. An artistic accent wherever it's needed, this table could serve as a glamorous nightstand or an intimate coffee table in a cozy sitting area.